Please welcome our newest reviewer Millennium to the team! He’s here to kick things off with two brand new reviews! 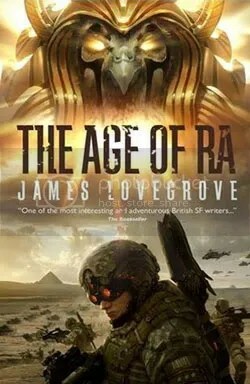 Age of Ra by James Lovegrove(Solaris Books) and Kell’s Legend by Andy Remic(Angry Robot Books). He’s even provided his 5 point rating scale for us to reference. You’ll be sure to see many more reviews by him in the future. A mix between ancient Egyptian gods and futuristic battles where humans are pawns in a game; this book is extremely well written. With every twist and turn that unravels the mysteries of a man and his lost brother. Even though that it has a slow start it has thrilling and unexpected twist of fate. But what’s fate to a god. It takes place in a semi futuristic time kind of like the star wars where even though they have all this cool technology many things are like the old Egyptian times. The main character is extremely easy to relate to. I’m glad that for my first review it was this book. At first it takes some getting used to flip flopping from the real world to the point of view of the gods. But you get used to it quickly. The way that they depict the gods is sort of strange like a family reality show and with a mix of back ground info but even if you don’t know any of the old Egyptian gods they fill you in pretty well. When David goes out on a routine mission he’s thrown in for the fight if his life and was left for dead is captured and has to watch as all of his men die (after an epic battle including mummies!) he defies all odds gets captured again but with a bit of luck he hocks up with some riders. The next thing you know he’s signed up with a town called Freegyptians who despise the gods and would if they could have it rid the world of them. As a whole it’s a great book and had me excited to pick up the book. BUY or PASS: This book is definitely a buy. I’d have to rate it a 4. 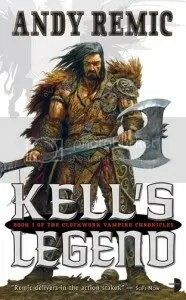 Enter: Kell, the legendary warrior from fabled tales. He is a fearsome warrior from years gone by, but when his own village is attacked he is forced to pick up his blood axe to save his granddaughter from mechanical fiends and other horrible creatures, he brings us along a bloody ride while exploring the secrets of a race of vampire/ machine like people that are trying to over throw the empire. This book is so enticing that you won’t be able to put it down. In the beginning every things all fine and you don’t know where the book will take you then out of the blue total chaos brakes out. In a few short chapters the whole village is over ruined and enslaved. The least likely character is a total killing machine with some past problems ends up risking his life for a thief that he barley knows which puts his granddaughter’s life at risk. Throughout the way he has to constantly fight of these huge grotesque beasts that are also part machine and even more disturbing part human. At the same time as were following Kells story were fallowing a young women who’s also trying to escape. Throughout her whole life she had to live with the idea that she was impure of blood which is no fault of her own and is punishable by death. She seeks out the answers of her father’s past and intertwines both hers and Kells fate. RATING: 5 it is one of the best books I’ve read in a long time.